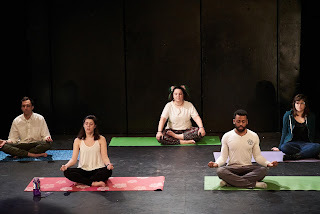 Theater in the Now: Review: Ohm No! Bed and breakfasts are often known for offering peace, quiet, and an escape from reality. But what if your B&B was sitting on something a little explosive? 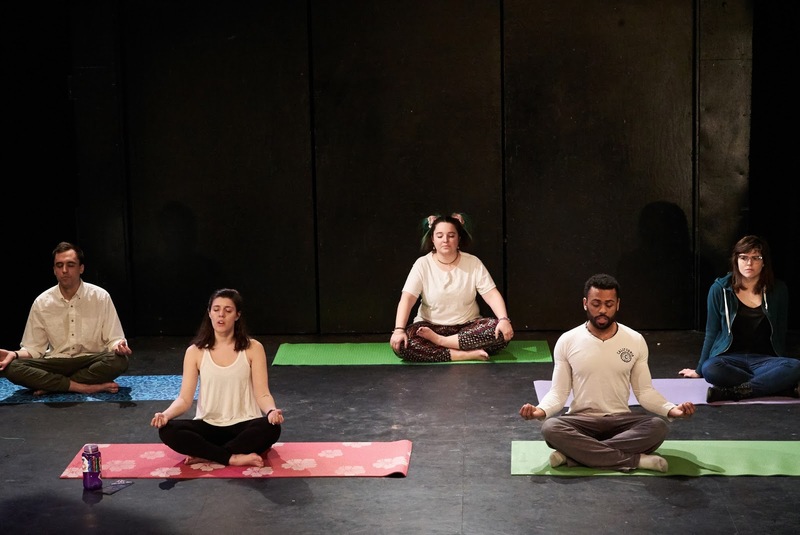 As part of the 2017 Frigid Festival, Sienna’s Mantram or (a Change of Pace at China Lake) by Zach Stephens is an explosive conspiracy comedy that will get you questioning your own existence. A conspiracy theorist, a thrill seeker, a couple on the rocks, and a gay looking for serenity arrive at a bed and breakfast in the Mojave. It's not the set up of a joke but the premise of Sienna's Mantram. As the guests look over some reading material on the brochure, they learn the frightening history of the getaway. They also soon become aware of what is described as a film shoot for another "Lawrence of Arabia," but the sound effects don't seem to line up. The more they speculate, the more they fear the terror and reality. Sienna's Mantram is an inherently twisted dark comedy. Stephens has planted a seed for something exciting. It's almost like watching a modern day adult "Scooby Doo Mysteries." Should he want to expand and look at some restructuring, especially when it comes to the dual introductory scenes, Sienna's Mantram can be a hoot. There's also even more room to build upon the characters and their personal conflicts within the broader scope of the piece. Perhaps opening the play with couple Charlie and Ingrid in a prologue type scene can not only introduce them and their wants and desires but neatly introduce the world we're about to visit. In a sense, they are our eyes into this play. But there was something not quite right in this production. Whether it was the time restrictions of the festival or a disconnect in visionary intent, the text from the page didn't match the action on the stage. Sienna's Mantram should be a laugh riot but director Kelly Webb seemed to go for something a bit more dramatic through the darkness. The scenario is plausibly ridiculous but the characters played it quite straight. Well, three-fifths of the cast did. Perhaps it comes to casting but the gentlemen of the cast, Zach Stephens and James Arthurt, took on big, broad comedy while the ladies did not. It felt as if they lived in different worlds. The more interesting choice is big, broad comedy. Throw in more physical comedy and this can be achieved but not all actors seemed to be well-versed in this brand of comedy. Sienna’s Mantram has all the makings of a poignant and visceral twisted comedy that lends itself to today. It just needs a bit of finessing and clarity. But when it gets there, be afraid. Zach Stephens will scare you.